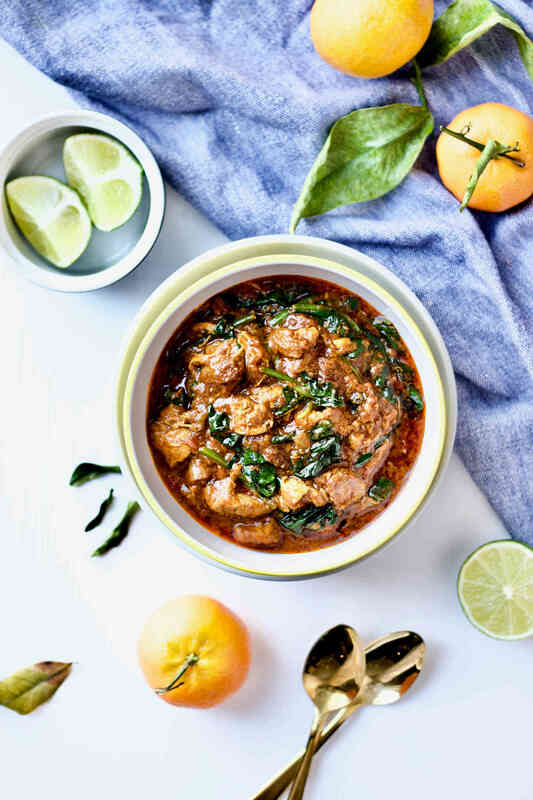 A flavourful and nourishing lamb and spinach curry that’s allergy-friendly (dairy-free, gluten-free, nut-free), whole 30 and paleo compliant if you choose to pair with rice and bread alternatives. I also chat about eating the right foods for the right season. Lamb is a warming and nourishing food perfect for the winter time, so are the warming spices in curry. When the snow is falling outside, our body naturally long for foods that provide us the extra heat and energy. 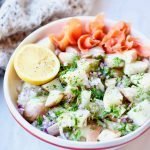 We are in January right now, and I see a lot of people around me doing healthy eating challenges after the big holiday season. 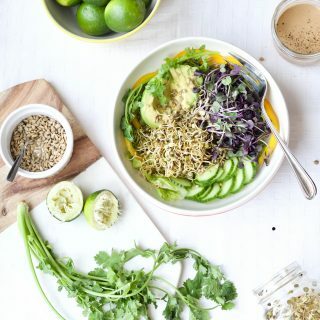 A lot of recipes popping up for salads and detox; and others focusing heavily on sticking to a specific dietary protocols but lacking attention to the selection of ingredients. 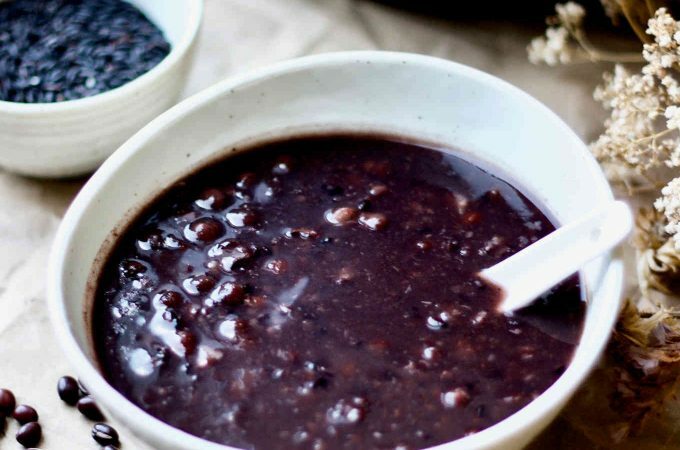 It’s great to incorporate some of these foods into a healthy diet, but in the middle of January (in fact all the way from autumn to winter), the primary focus should be warming and deeply nourishing foods. I know all you earthy and crunchy mamas would agree with me on connecting our eating habits to seasonal changes. 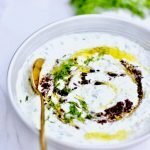 I am sure you have felt that in the summer you long for the cooling cucumbers and watermelons, juices and salads and in the winter time stews, soups and red meats. But have you thought that other than satisfying our innate desire, such food choices also contribute to keeping our health in balance? Given my Asian background, you know I would be talking about Eastern medicine. Traditional Chinese medicine is what I have been exposed to the most, but I believe in Ayurvedic medicine there are also similar theories. There are many environmental elements that could lead to illnesses, such as “heat”, “cold”, “wind”, “dampness”, “dryness” – I will have to write a separate post in the future to share more details, for now, let’s only talk about “cold” as the the biggest characteristic of winter. A balanced health (in all aspects) is key to prevent illnesses. To keep our inner system in balance, eating warming foods in the winter can help us negate the effects of external “cold”. Warming foods include not just foods warm in temperature, but also foods that have warming effects on us. 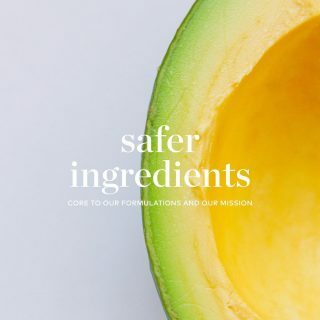 In Chinese medicine that has existed since long before science advanced to the point to analyze micronutrients in each food, food ingredients are traditionally described in terms of their various effects on us. At this point, I don’t have a central English resource to point you to for the entire food list. However, I can say based on traditional wisdoms, Lamb is a top warming and nourishing food choice for the coldest and snowy time of the year. Well, I live in Canada and I love my lamb and spinach curry in the many months of the never-ending winter. If you live in a no-snow zone or doesn’t have winter at all, keep in mind to adjust your food choices accordingly for your local climate. To maximize the benefits of turmeric, eat it with black pepper and fat. 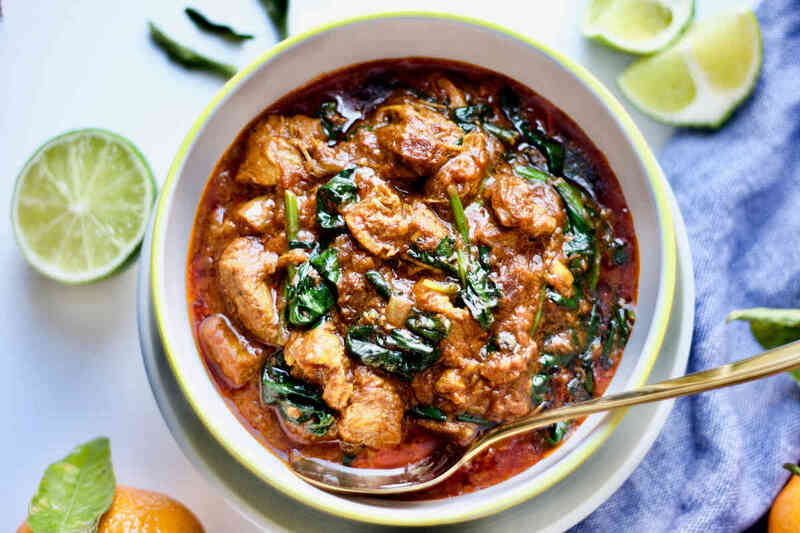 This lamb and spinach curry is a great example to take full advantage of the turmeric/curcumin. I also discussed this about turmeric in my turmeric sauerkraut recipe. In my orange cranberry coconut scones recipe I talked about the differences between Ceylon vs. Cassia cinnamon and why we should opt for Ceylon cinnamon given the choices. 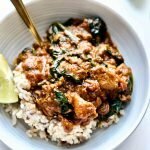 Ginger is so readily available and inexpensive that you can afford to use freshly grated instead of ground ginger in this lamb and spinach curry. Store the extra ginger roots in the freezer to ensure what you can’t use up will not go bad and go to waste. 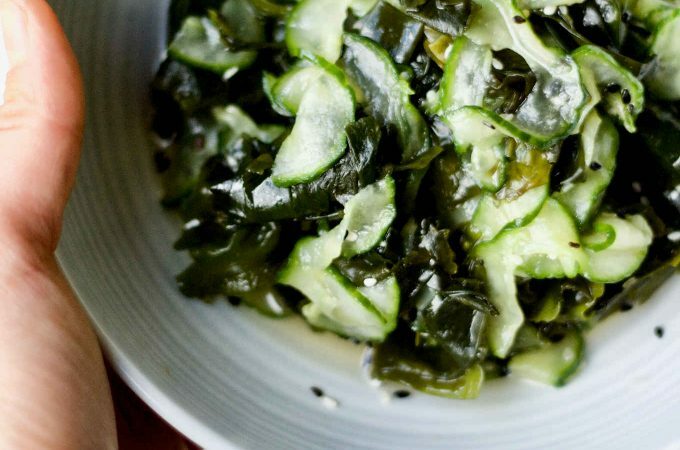 Try this ginger-mustard-miso brussels sprouts or this ginger orange pickled daikon. 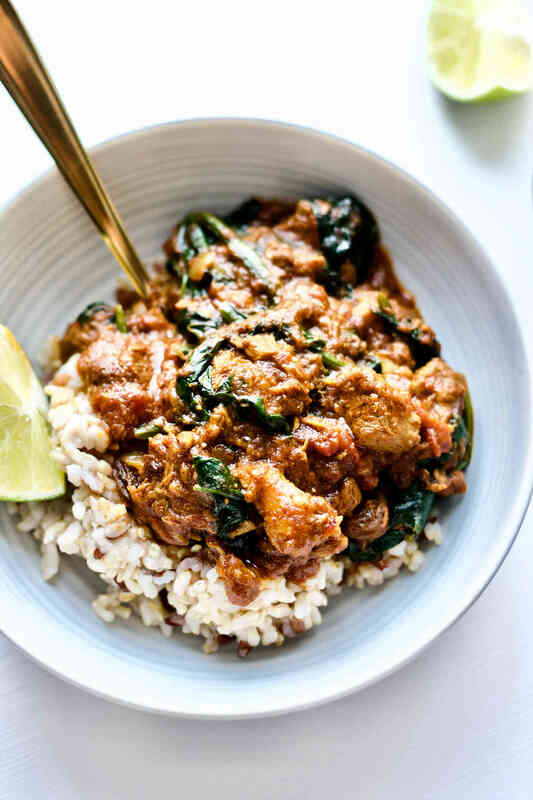 A flavourful and nourishing lamb and spinach curry that's allergy-friendly (dairy-free, gluten-free, nut-free), whole 30 and paleo compliant if you choose to pair with rice and bread alternatives. Heat the coconut oil in a large pan and add onions, garlic, ginger, turmeric, nutmeg, cinnamon and paprika. Stir-fry for a few minutes until the aromatics and spices are fragrant. Add the lamb pieces to the pan and stir for a few more minutes to brown the lamb. Add the diced tomatoes, water, raisins, salt and pepper to the pan. Stir and bring to a boil. Cover the pan and reduce the heat to let it simmer for 1.5 hour. Add the spinach leaves to the pan. Cook for a few more minutes until all the spinach are wilted and tender. 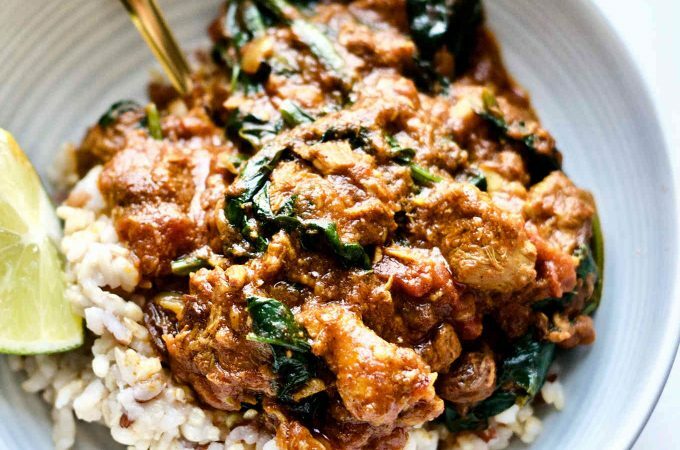 Taste the lamb and spinach curry. Add more salt if required. Remove from heat and serve. Gorgeous photos and my favorite lamb! I would love to try it as soon as i will go to Costco next time to buy meat! I’m a huge lamb curry fan! I’ve never put raisins in mine though, so I’ll have to try this next time! My husband loves lamb, but I’ve never cooked it before. 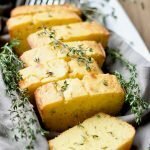 This looks like the perfect recipe for my first try! 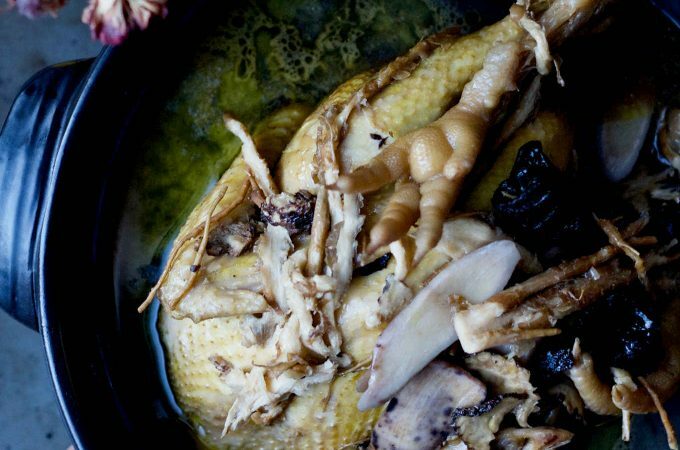 What a lovely dish on a Winter evening! Looks beautiful and sounds totally delicious! Omg this looks like heaven! My boyfriend’s favourite food is curry! Going to make this for him!! I have never been a lamb fan but this could very well win me over! The flavors sound amazing! This is a top notch receipe. I can not wait to make this, looks very satisfying. I am a huge curry fan! 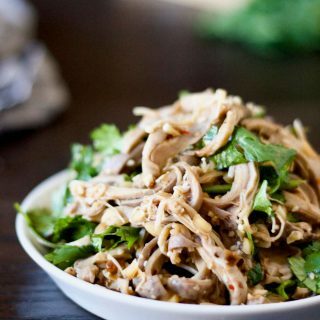 This looks like its packed full of flavor and nutritious too! I love Indian food so this curry would be right up my alley. 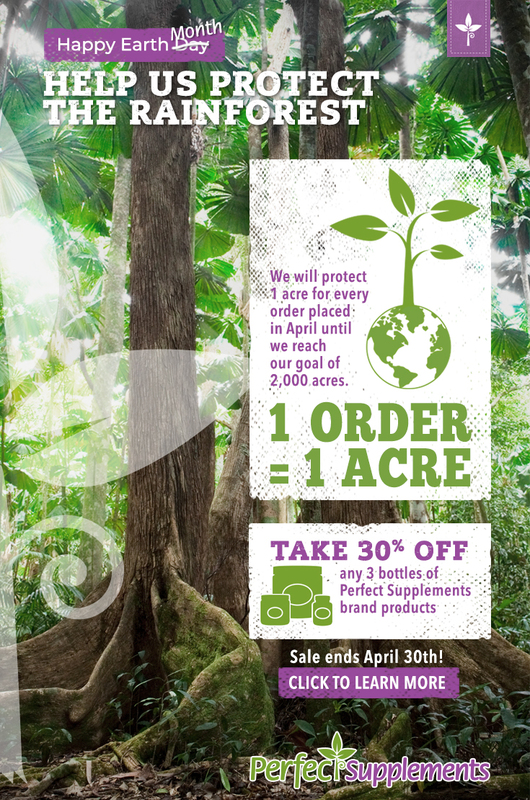 The fact that it’s Whole30 as well is a bonus! LOVE these flavors and the addition of the raisins!!! So yummy and beautiful too. This looks fantastic! Pinned to my W30 board! I am looking forward to reading more of your posts on Chinese medicine Yang! Eating according to the season and stimulating warmth in the body when it’s cold outside is very important. This curry looks incredible, lamb is one of my favourite meats! Thank you so much Monique! Lamb is SOOO my favourite meat too. I have to intentionally limit how much lamb I eat during the warm months – that’s how much I love it 🙂 I can’t wait to share more on Chinese medicine, it really has helped me to understand how to regulate my health by foods to work with the change in nature. This recipe looks so incredible with all those warming spices. I follow a keto diet so this would probably be too high in carbs for me but maybe if I omitted the raisins? If it does need a touch of sweetness to balance out the flavors, do you think a touch of keto compliant monkfruit would work? Based on my understanding the only ingredient not Keto here is the raisins. I think the recipe would be ok without raisins, but definitely better with for the reason you stated – balanced flavour! Is it a kind of monkfruit extract/powder you are talking about? I would guess it is ok. Monkfruit is actually a very popular Chinese herb that we use whole in soups and medicines for coughs. I haven’t used the extract as sugar replacement, but considering how sweet it is, it makes sense people use it as sweetener. I do wonder if the extract/powder that’s processed still contain any of the medicinal properties. 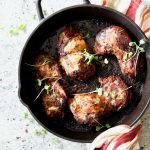 I love lamb dishes and this looks so comforting and delicious! This looks like pure comfort food!! Oh my. this looks amazing!! I bet this would be good with beef too!! Yum!